A GERMAN COURT has thrown out a case against an 89-year-old former soldier over the Nazis’ worst atrocity on French soil, the 1944 massacre in the village of Oradour-sur-Glane. In a move that met with anger and disappointment among survivors, the regional court in the western city of Cologne said it would not try the pensioner, citing a lack of evidence. The man, who was identified in media reports as Werner Christukat, was charged in January with the murder of 25 people committed by a group, and with aiding and abetting the murder of several hundred people. 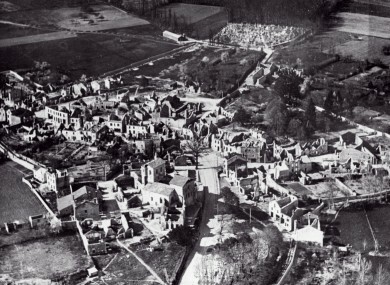 SS troops slaughtered 642 people in the tiny village in western France on June 10, 1944, in a horrific World War II crime that deeply scarred the French nation. The tribunal said it had examined whether the available evidence would likely be sufficient to lead to a conviction. “The court determined with today’s decision that this was not the case,” it said. Both the prosecution and co-plaintiffs representing victims’ families have the right to appeal the ruling within a week. Christukat, who was 19 at the time, had acknowledged that he was in Oradour-sur-Glane and a member of the SS but disputed any involvement in the murders. The male victims were shot with machine guns in a barn, with any survivors shot at close range with pistols before the barn was set ablaze. Prosecutors had said that the suspect then went to the village church where several hundred women and children were being held prisoner. Members of the unit used explosives, automatic weapons and hand grenades to kill many of them, then set the church on fire. Christukat was accused of abetting the murder by either assuming blockade and surveillance duties within sight of the church or carrying flammable material to the church. The charges were part of a twilight bid by the German justice system to prosecute crimes committed by the Nazis. Germany in 2010 reopened a war crimes case into the Oradour-sur-Glane attack when a historian discovered documents implicating six suspects in their eighties. Probes were opened against seven of them but prosecutor Andreas Brendel, head of the central Nazi war crimes investigation unit in the western city of Dortmund, told AFP today that none of the other suspects had been charged. The other five soldiers have already served sentences in France. Brendel said he was “surprised” by the Cologne court’s decision and that he would consider filing an appeal, but he admitted the evidence in such cases was generally “extremely thin”. Email “Court won't prosecute 89 year old over worst Nazi atrocity on French soil”. Feedback on “Court won't prosecute 89 year old over worst Nazi atrocity on French soil”.